Petroleum was discovered seeping from a river bank in west Texas. The seepage was traced back to a 8-inch oil pipeline leak approximately 40 feet from the river bank. Investigation of the pipeline leak showed contamination in the soil around the pipeline and the ground water below it. Petrox® was used to treat the soils and ground water at the source to mitigate the seepage. Petrox® bioremediation reduced the contaminant concentrations to acceptable levels in less than one year. Treatment Area: 5,000 sq. ft. Saturated aquifer thickness: 5 ft. Treatment: Three applications, initial treatment with 2 units of Petrox® and 2 follow up treatment with 2 units of Petrox® and a calcium peroxide oxygen supplement. Petrox® bioremediation quickly and cost-effectively removed the sheen and reduced the contaminant concentrations to acceptable levels. The metabolism of petroleum requires the presence of oxygen, which was added through the injection of calcium peroxide. Petrox® bioaugmentation accelerated the site remediation and reduced uncertainty by applying the right microbes where they were needed, the calcium peroxide provided the right growth conditions for the beneficial microbes. Petrox is a specialty bioremediation product comprised of patented strains of live vegetative aerobic microorganisms providing fast, effective degradation of petroleum hydrocarbons. The oil-field pit treatment demonstrates the effectiveness of PETROX to treat oil production wastes encountered during the closure of multiple lagoons in the Southeast. Regulations required oil and grease concentrations below 1% prior to closure. PETROX reduced the petroleum to compliance levels in less than 30 days. High concentrations of petroleum in the subsurface can accumulate in a separate liquid phase that floats on the water table, which is referred to as light non-aqueous phase liquid (LNAPL). Investigation and characterization of the extent of separate phase petroleum is challenging. In turn, successful remediation, which depends on accurate and complete site characterization, can be equally challenging. In this case study Petrox® bioaugmentation was used to remove LNAPL and dissolved-phase petroleum to achieve No Further Action status. The site is located in the Georgia Piedmont where the geology is characteristically weathered granite and saprolite. The petroleum was found in layers of interbedded clay, silt and sand. The first water was encountered at approximately 28 feet below ground surface. The hydraulic conductivity based on slug tests of the impacted zone was 10-4 to 10-5 cm/sec. The ground water aquifer was naturally aerobic. Dissolved oxygen measurements taken from monitoring wells in the source area ranged from 1.9 to 2.1 mg/L. The oxidation-reduction potential (ORP) measured in the same wells ranged from 241 to 283 mv. The aerobic conditions were not typical of petroleum releases, but favored in situ bioremediation. During the implementation of bioremediation, the region experienced a drought. The water table dropped below the bottom of some of the monitoring well screens for part of the period. Sampling results may have been affected during the drought, but normal ground water conditions were restored and maintained for the final two years of monitoring. The leaking underground storage tank (UST) was removed and a temporary high-vacuum dual phase extraction system was operated for one day in April 2007. Approximately 50 gallons of petroleum was removed by the high vacuum system. After operation of the high vacuum system was discontinued, the source area total benzene, toluene, ethyl benzene and xylene concentrations was more than 143,000 µg/L and 22 inches of separate phase petroleum was found in a monitoring well outside of the former UST cavity. The remediation goals were to remove the separate phase product and reduce the dissolved phase BTEX concentrations to below in-stream water standards. The remediation approach was combination of in situ Petrox® bioremediation and periodic liquid phase bailing. It was believed that the petroleum was present in a thin layer, but represented itself as a thicker layer in the monitoring well that intersected the layer. The separate phase was bailed out when it was encountered during monitoring events. Petrox® bioremediation was used to degrade the petroleum in the ground between the former UST cavity and the impacted down gradient monitoring wells. Petrox® was introduced into the contaminated ground water in three applications by injection through nine temporary well points surrounding the former UST location. The first injection was 275 gallons of microbial slurry in August 2007. The dissolved phase BTEX concentration decreased by more than 60%. The contaminant concentrations continued to decrease for a year following the first injection. The BTEX concentration was reduced by 90% in that first year. A second injection of 110 gallons of Petrox was completed in September 2008. After one month the BTEX concentrations decreased by 50%. 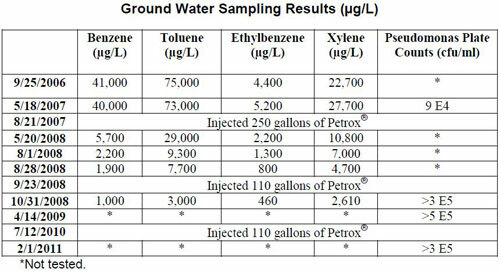 The following table summarizes the treatment and contaminant removal results. The analysis of ground water samples for Pseudomonas sp. by plate count analysis showed the microbial population increased over background levels. The Petrox population maintained an effective level for bioremediation for 6 months to a year following each application. The separate phase was reportedly no longer present in 2011 and the site received a No Further Action Status designation. This project demonstrates the benefits of bioaugmentation for high concentrations of petroleum in ground water. Bioaugmentation delivers very high population of effective petroleum-degrading organisms that can be sustained for a long time. The microbes are compatible with bailing out accumulated separate phase from monitoring wells to accelerate the site closure. The total cost for microbes used to close this site was $8,000. Petrox® bioaugmentation was implemented at a petroleum remediation site in Morris County, New Jersey to destroy residual petroleum compounds in ground water. The impacted ground water was in bedrock fractures under and down gradient of a former UST location. The UST was removed and an oxygen release compound was added to the ground water to stimulate bioremediation. However, residual contamination persisted and Petrox® bioremediation was implemented to remove the residual low concentration found at the site. The bedrock surface was fairly close to the ground surface and the first ground water encountered upon drilling at the site was within the bedrock. Impacted ground water was contained within the fractures near the bedrock surface in a zone estimated to be 40 feet thick. Low concentrations of benzene, xylene, ethylbenzene and toluene were present in ground water at and down gradient of the former UST cavity. The area of proposed treatment was 3,600 square feet. Petrox was applied in two monthly applications of 8 units each. One unit of Petrox® is a 55-gallon slurry with a microbial concentration of 109 cfu/ml. ORC socks were installed in treatment wells to provide an oxygen source for the petroleum metabolism. The monthly Petrox® injections were on May 29, 2009 and June 26, 2009. Post -treatment samples were taken on June 10, 2009 and May 4, 2010. 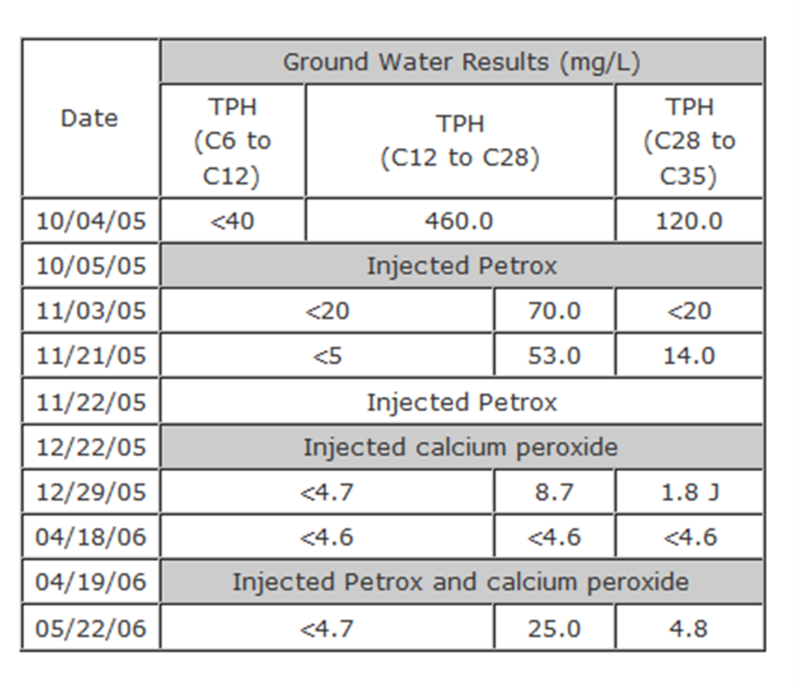 The following table shows the contaminant concentration treads in the treatment area. The treatment was successful in reducing the BTEX concentration at the site. However, the increase in concentrations after the first treatment showed that there were residual petroleum constituents in the source that was not reflected in the pre-treatment sampling. Petrox® microbes were detected in all of the bedrock sampling points as far as 30 feet down gradient of an injection point. Overall the treatment verified the effectiveness of Petrox® bioaugmentation in fractured bedrock.